Too long, didn’t read may be the most annoying, yet common, consequence of our media hunger. Go on Facebook, and you’ll see plenty os users having lengthy arguments over stories they did not read. It makes the title of news stories ever more important, albeit, in a superficial, click-bait way. This was easily demonstrated on April 1 of this year when NPR shared a story about how many Americans no longer reads. The resulting barrage of defensive Americans came thunderously to the defense of their reading habits and their son’s as well – all while not reading the actual story. 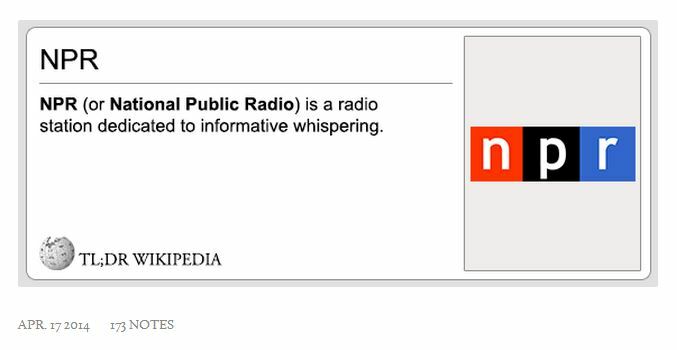 Now, there’s an adequate response to that kind of quixotic information consumption for those who like Wikipedia: TL;DR. Go there and you can see for yourself, shortened versions of long, informative, user-submitted data on some of the world’s most common knowledge. It’s snarky, and more importantly, short. Go on over – it’s fun, and it’s not too long.